HomeLet’s enjoy Korean traditional paintings! The Korean TV drama “Saimdang: Light’s Diary” (사임당, 빛의 일기) currently being aired is about the life of Shin Saimdang (1504-1551), a famous female poet and artist of the Joseon period. In the drama, you can often see Korean traditional paintings during the Joseon period. I really like the Korean traditional paintings – they’re simple but elegant. 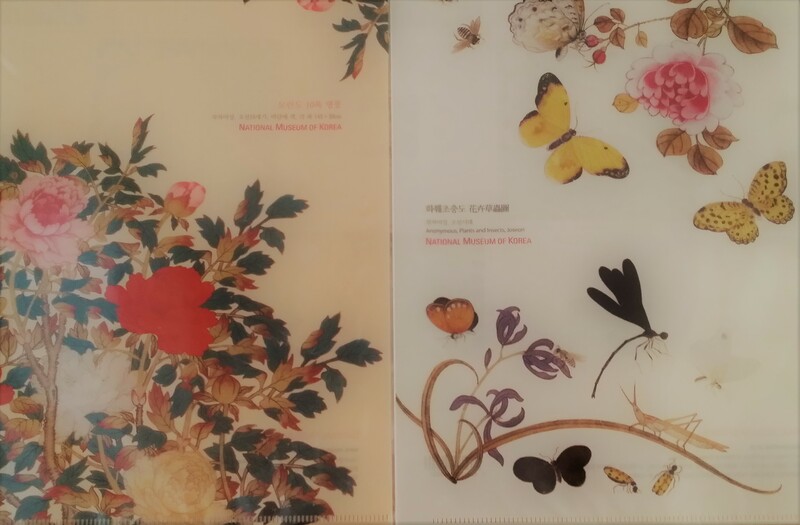 When I visited the National Museum of Korea, I also bought file folders with the Korean traditional paintings (as shown in the photos above). In this post, let’s have a brief overview of the Korean traditional paintings – for the purpose of this post, it means Korean paintings up to and including the Joseon period. Korean traditional paintings can be dated back to the Goguryeo period (37 B.C.-668 A.D.) in which tomb murals painted directly onto the stone walls or applied to a lime plaster were an important art form. These murals depicted the tomb’s occupants, warriors on horseback, mythical animals, birds, snakes, tortoise, daily lives of the people and architecture, and their typical features are bright colours and flowing outlines. You can click here to see a tortoise and snake mural in a Goguryeo tomb. During the Goryeo period (918-1392), Buddhism flourished and with the patronage of the royal court and the aristocracy, there were a lot of paintings related to Buddhist icons like the Buddha and Buddhist monks. During this period, paintings were devoted mainly to religious purposes. With the influence of Confucianism, there were paintings depicting the Confucian values, for example, the Four Gentlemen of Plants representing the qualities of a learned man, i.e., orchid (representing refinement), chrysanthemum (representing productive and fruitful life), bamboo (representing integrity), and plum blossoms (representing courage). Although portraits were produced throughout the Korean history, portraits depicting kings, aristocrats, women, elderly officials, and Buddhist monks were painted in large quantities during the Joseon period. Minhwa (folk paintings) were paintings by anonymous artists and were characterized by vivid colours. Most of these paintings were intended to bring good luck to the people, so their subjects included tiger (messenger of mountain spirit), ten symbols of longevity (sun, clouds, mountains, rocks, water, pine trees, mushroom-of-immortality, turtles, white cranes and deer), paired birds (symbolizing marital love), insects and flowers (representing harmony between yin and yang) and bookshelves (symbolizing wisdom). You can see examples of folk paintings on the symbols of longevity by clicking this link. The above is a brief overview of the Korean traditional paintings. Hope it can help you better understand and enjoy the Korean traditional paintings! ← Let’s get hands-on Korean cultural experience! Thank you for all the information. I also love their traditional paintings. It’s quite mesmerizing. If you like traditional paintings, you may go to the National Museum of Korea and Insadong in Seoul. There are good stuff for you to enjoy!